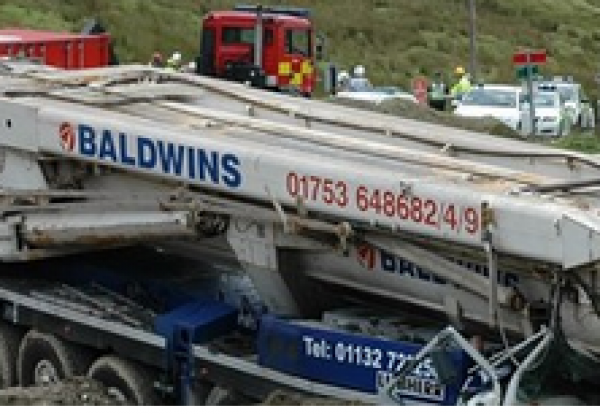 Baldwins Crane Hire has been fined £700,000 after the death of its operator Lindsay Easton at the Scout Moor wind farm in East Lancashire four years ago. Following a trial in November, the company was found guilty of corporate manslaughter, failing to ensure the safety of its employees and failing to ensure the safety of other persons. Mr Easton, from West Yorkshire, was driving a 130-tonne mobile crane on a road from Scout Moor quarry in Edenfield, near Ramsbottom, when the brake system failed. The vehicle, travelling on a steep access road, lost control and crashed into an earth bank. The front of the vehicle was crushed, with Mr Easton dying from multiple injuries. Following the incident an investigation was launched by Lancashire Police, working alongside the Health and Safety Executive. It was found that several of the wheel brakes were inoperable, worn or contaminated. The engine retarding (braking) systems were also found to be non-functional, disabled or damaged providing only limited braking force. As part of the investigation, brakes were inspected across the Baldwins fleet with several other cranes found to have significant issues which required immediate work. Significant failings were also found within the company structure. There was a lack of supervision and recording taking place of organised maintenance work by senior management. The trial also heard the crane was not Mr Easton’s usual vehicle, having replaced another operator when he took over the site operation. Det Sgt John McNamara, of Lancashire Police, said: “We welcome today’s sentencing and hope it serves as a reminder to all companies to properly manage and maintain equipment, vehicles and to keep the safety of their employees at the forefront of their responsibilities. “The brakes on the crane driven by Mr Easton that day were in a shockingly bad state and this was a disaster waiting to happen. Had this happened on a road with more vehicles this incident could have been even more serious than it already was. “The safety of employees is of utmost importance in the workplace and Baldwins Crane Hire clearly neglected its responsibilities and sadly Mr Easton paid the price. “Mr Easton’s death was wholly avoidable. Tragically the gross failings of the company management have led to the death of an experienced crane driver who was simply doing his job, causing enduring heartache for his family. I hope the sentence brings some closure for his family during what has been a traumatic and difficult time. “This was a lengthy and detailed investigation which despite Baldwin’s maintaining their innocence throughout has resulted in the jury returning unanimous guilty verdicts. Speaking after the hearing, HSE Inspector Kevin Jones added: “This was a complex investigation involving a high level of collaboration between HSE and Lancashire Police especially in relation to the forensic examination of the crane’s braking systems. “This joint working with Lancashire Police contributed to bringing this case to a successful conclusion.